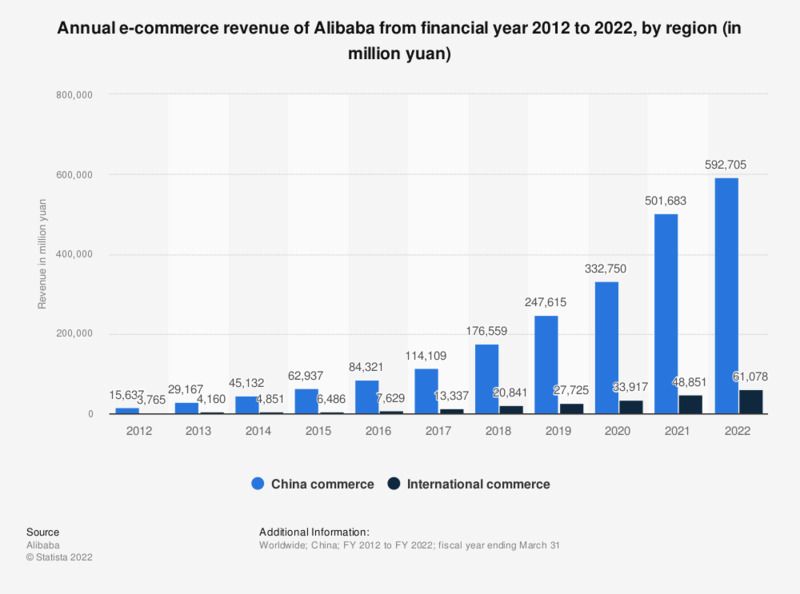 The statistic shows the annual online commerce revenues of the Alibaba Group from 2010 to 2018. In the fiscal year ending March 31, 2018, the Chinese e-commerce corporation recorded a revenue of 176.6 billion yuan in Chinese online sales. This translates to approximately 20.8 billion U.S. dollars. As of 2015, China is catching up with the United States in the battle for e-commerce supremacy. The Asian country has generated almost 250 billion U.S. dollars from online sales and is set to dethrone the United States as the largest market in the world in the following years. Some of the factors contributing to this growth are increased internet penetration and ever-growing spending power of the general population, but also the expansion of e-commerce giant Alibaba Group. The revenue of Alibaba Group reached 101 billion yuan (approximately 15.69 billion dollars) in 2016, with the largest part of the platform’s revenues coming from its e-commerce stream, worth over 80 billion yuan in 2016 in China alone. Alibaba’s most prominent e-commerce websites are Taobao Marketplace, TMall and Alibaba.com, an online market platform called Alimama, a developer of platforms for cloud computing and data management called Alicloud, as well as a financial services provider called Ant Finacial Services Group, to only name a few of its ventures. Payment provider Alipay has been spun off in 2010 into an independent company. The company’s most profitable day in 2015 was Single’s Day, a popular Chinese festival functioning like the antithesis of Valentine’s Day. On November 11, Chinese singles throughout the country celebrate being single and proud, especially by treating themselves with presents. Around this date in 2015, almost 500 million orders were placed on Alibaba's Tmall and Taobao, amounting to over 14 billion U.S. dollars in sales. Data is based on GAAP regulations.